One cloudy October morning in 2012, the orchestra met for our monthly meeting to catch up on any news from our staff, review marketing and finance reports, offer advice on new projects in the works, etc. The meeting was business as usual until Jeanne Lamon, our long-time Music Director, requested the orchestra’s presence a little longer. Without much ado, she announced big news – she was retiring from her position as Music Director of Tafelmusik. For the first time ever in an orchestra meeting, the room was completely silent. I saw tears running down one of the other orchestra members’ faces, and felt them hot on my own cheeks. Finally someone, I think it was John Abberger, articulated “This news has left us speechless.” We knew in the backs of our minds that this day was coming, but on that October day, we felt the news was shocking and sudden. We weren’t ready. I think Jeanne was a little surprised by our reaction, but luckily she knew us well enough that she had brought prosecco to the meeting! We did our best to enthusiastically toast her leadership and new life, even though it was only 11:00 in the morning. Over the next little while, we began the search for a new Music Director. The organization gathered together to choose an eleven-member “search committee” to oversee the whole process, which included musicians, staff, board members, and trusted advisors. Based on input from the whole organization, the search committee put together a job listing which encompassed Tafelmusik’s core values, “deal-breakers,” and hopes for the future. The orchestra mobilized and pored over recordings, YouTube videos, and websites of hundreds of baroque musicians to choose a small number of the most beloved to recommend that the search committee invite to perform with us as potential candidates for the MD position. The search committee painstakingly read and listened to many applications from talented musicians living all over the world. Over the next two years, I had the opportunity, as one of the musicians on the search committee, to have a first-hand view of the search process. I saw how the orchestra grew and changed as we worked with each wonderful guest director. I saw how our feelings of despair over the news of Jeanne’s retirement changed to acceptance and support for her new lifestyle and our new relationship with her. For us it was wonderful to have such a long process. We needed it. We became more flexible as a group, we became more open to new ideas, we became less reliant on Jeanne and more self-sufficient as a group. And as time passed, as a member of the search committee, I became less mystified by the orchestra’s evaluations and audience comments after our weeks with guest directors, and more able to see what were the needs of this unique group of musicians and its dedicated staff members, board members, volunteers, and audience members. One of the last guest musicians to be invited to be part of the search for a new Music Director came about due to a hole in our schedule. We had a concert in November 2015 with no director. We also happened to have just hired a new violist from Italy, Stefano Marcocchi. I remember talking to him one day backstage before a performance at Koerner Hall, describing all of the things I thought Tafelmusik was looking for in a new Music Director. The name that came first and foremost to his mind was a name we hadn’t heard before – Elisa Citterio. He sent us an incredibly beautiful live recording of Elisa directing Corelli concerti grossi, and we were excited to discover an amazing new violinist! Elisa came from Milan that November to play with us, and I was immediately struck by her incredible violin playing, her warm and vibrant personality, her confidence, her super-efficient rehearsal style, and her high level of attention to detail. Her style is a little different than ours – she uses a very sharp articulation (great for the new acoustics in Jeanne Lamon Hall at Trinity St. Paul’s), and she loves the extreme dynamics typical of both historical and contemporary Italian musicians playing baroque music. That first week, it took the orchestra a few days to gel with her musically, but by the end of the week, everyone was having a wonderful time playing together. We loved her positive energy, her flawless technique, her creative ideas, and the way the music grew and changed every day, coming to life in different ways in each concert. The moment I will never forget that week was about three minutes into the first concert. The orchestra was feeling stressed (first-concert jitters) and I looked up at Elisa – she had a big beautiful smile on her face that said to me, “This is exactly the place I am supposed to be right now. I love this!” It was inspiring. The second time we met Elisa (September 2016) was a much different experience, especially for Elisa! This time she and her partner Mirko brought their two-month-old daughter Olivia. Elisa was playing the very first concerts after her first child was born! We were stunned that in the face of utter exhaustion, Elisa still brought the same boundless energy and joy for the music with her. The rehearsals were organized and efficient, her ideas and cues were clear, creative, and easy to follow, and I don’t think I heard one out-of-tune note from her during the entire rehearsal period and concerts! No matter how tired she seemed offstage, the minute she stepped in front of the orchestra, she had all of the energy in the world for us. We had a lot of fun playing those concerts with her, and many of us remarked how fresh Handel’s Water Music (a piece we have played many times) felt under her direction. For an orchestra that plays as many concerts as we do (we have performed The Galileo Project over 70 times), the ability to keep music fresh and alive is essential. At the beginning of the process, violinist Tom Georgi said to the orchestra at one of our many meetings, “We are going to see lots of people, and in the end, we are all going to agree.” To my complete surprise, he was right. We saw a lot of people, and in the end were in complete agreement that Elisa was the person with whom we saw ourselves building a wonderful musical life. We were thrilled when we found out that the rest of the search committee agreed with us. They too saw the special qualities, both personal and musical, that make Elisa an ideal person for this position. We were even more thrilled when Elisa accepted our offer to become the new music director of Tafelmusik!!! This process has been long but fruitful. We have had the luxury of time to find new ways of doing things, and forge new friendships with some of the baroque world’s brightest stars. We all love Jeanne Lamon, and she continues to be such a valued part of this organization. We needed time to get used to her having a different role in Tafelmusik, and time to open our minds to change. Finally I feel like now we are ready to begin a new era, which will be different in countless ways, but similar in the ways that we hold so dear ­­– Tafelmusik will continue to make great music together to the highest level with boundless energy and joy. I feel so lucky to be part of a group like this and I look forward to all of us developing a close new relationship with our wonderful new Music Director, Elisa Citterio. Peter Harvey, baritone; Jeanne Lamon & Julia Wedman, violin; Thomas Georgi & Patrick Jordan, viola; Christina Mahler, cello; Alison Mackay, violone & double bass; John Abberger, oboe; Dominic Teresi, dulcian; Lucas Harris, lute; Charlotte Nediger, organ. In programming our seasons, we often find ourselves turning to more intimate repertoire for our January concerts, an instinctive desire, perhaps, to warm up cold January evenings and Sunday afternoons with a cozy gathering of musicians and listeners. This season is no exception, as we invite British baritone Peter Harvey to join us in an exploration of rarely heard works written in the seventeenth century in German-speaking lands: both the Protestant north, and the Catholic south. As the concert includes works by two of J.S. Bach’s principal mentors, Buxtehude and Johann Christoph Bach, we could not resist looking forward, so end the program with J.S. Bach’s beautiful Cantata 82. 1681 publication of Biber’s Violin Sonatas. In a concert that combines the secular and sacred, it is appropriate that we open with a sonata for strings from Biber’s collection Fidicinium Sacro-Profanum, meaning “Sacred and profane fiddle music.” Two violins are in dialogue with two violas and continuo in a sonata that melds elements of the Italianate church sonata with courtly dance music. 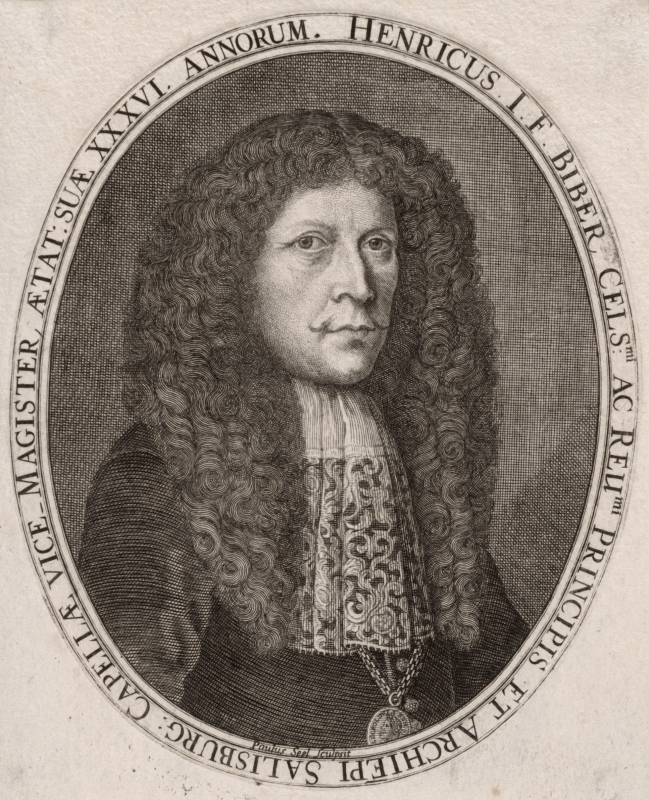 Heinrich Biber held positions at the archiepiscopal courts of Olmütz and Kremsier before assuming the post of Kapellmeister and eventually Lord High Steward to the Prince-Archbishop of Salzburg. His accomplishments were acknowledged by Leopold I with his ennoblement in 1690. Biber is credited with advancing the art of playing and composing for the violin to a height previously unknown north of Italy. The eighteenth-century music historian Charles Burney wrote “of all the violin players of the last century Biber seems to have been the best, and his solos are the most difficult and most fanciful of any music I have seen of the same period.” His violin sonatas are marked by virtuoso passagework, both in unmeasured passages and over ostinato basses, and by extensive use of double-stops (playing on two strings at once) and chords. The Third Sonata from his 1681 collection is typical. The opening prelude alternates free passages over long held notes in the bass with quick, almost bell-like, passages of double-stops. This is followed by a simple aria with two variations. A long unmeasured passage of remarkable virtuosity leads to a chaconne built over just four repeating bass notes, the last variations of which inspire an arresting ending. manager of the church, and directed an annual series of concerts at the church called “Abendmusik.” His extant music includes a large quantity of keyboard music, chamber sonatas, and some 125 cantatas. The cantata “Mein Herz ist bereit” is a setting of Psalm 57 for solo bass voice, accompanied by three violins, violone, and continuo. At the midpoint there is a particularly delightful imitation of the psaltery and harp called upon to awake the soul. Buxtehude’s influence on North German composers was widespread: famously, the 20-year-old J.S. Bach took a month’s leave from his job as organist in Arnstadt and walked 400 kilometres to Lübeck to meet the Danish master. The bassoonist, organist, and composer Philipp Friedrich Böddecker was born in Alsace to a family of musicians. He held posts in various cities in Germany and France, eventually settling in Stuttgart as organist at the collegiate church and teacher at the college. A handful of sacred works survive, as well as two virtuoso sonatas, one for violin and one for dulcian (the precursor of the bassoon). The latter is a stunning set of variations on a tune popular throughout Europe from the sixteenth through the eighteenth centuries. The title is drawn from the text associated with the tune in Italy: “Madre non me far monaca” (Mother, don’t make me become a nun). In Germany the tune came to be used as a chorale, and as such is the basis of a famous organ chorale by J.S. Bach, “Von Gott will ich nicht lassen,” BWV 658. In the Böddecker variations you will hear a violinist play the tune, first on its own, and then above increasingly florid variations played on the dulcian. A first cousin and close friend of Johann Sebastian Bach’s father, Johann Christoph Bach is thought to have had a great influence on the young Johann Sebastian, probably taking on much of his musical instruction upon the death of Sebastian’s father when Sebastian was just ten years old. Some years later Sebastian assembled the Altbachisches Archiv, a collection of works by his ancestors, and included several works by his mentor. Sebastian described him as a “profound composer […] as good at inventing beautiful thoughts as he was at expressing words.” Among the works in the Archiv are two remarkable laments, one for solo alto and the other for solo bass, both accompanied by solo violin and a consort of violas and continuo. They are passionate settings of potent texts, demanding much artistry of the singer and of the solo violinist, and leave a deep impression on performers and listeners alike. The Cantata “Ich habe genug” was written by J.S. Bach for the Feast of the Presentation of Jesus at the Temple, the last of the feasts of the Christmas season, also known as Candlemas, the Feast of the Purification of the Virgin, and in the Catholic Church as the fourth Joyful Mystery of the Rosary. It is celebrated on or around the 2nd of February; “Ich habe genug” was first performed on that date in 1727. The author of the text is not known, but it is based on the Gospel story of Simeon at the presentation of the infant Jesus in the Temple 40 days after his birth (St. Luke, chapter 2): “And it was revealed unto him [Simeon] by the Holy Ghost, that he should not see death, before he had seen the Lord’s Christ. And he came by the Spirit into the temple: and when the parents brought in the child Jesus, to do for him after the custom of the law, then took he him up in his arms, and blessed God, and said, ‘Lord, now lettest thou thy servant depart in peace, according to thy word: for mine eyes have seen thy salvation, which thou hast prepared before the face of all people.’ ” The story inspired Bach to set the middle movement as a lullaby, and his wife Anna Magdalena included this movement in the notebook she prepared for her own use, and for use with her children. The cantata is one of the most famous of Bach’s cantatas for solo voice, and one that was performed several times during Bach’s tenure at Leipzig. Originally written as we are performing it this week, for solo bass voice with obbligato oboe, Bach also left versions for soprano and flute, and for alto and oboe. Join us for Intimate German Baroque, January 19-22 at Jeanne Lamon Hall, Trinity-St. Paul’s Centre. Tickets are available here. We’ve put together a playlist of (most) of the music you’ll hear at Intimate German Baroque (Jan 19 – 22, 2017), featuring English baritone Peter Harvey and Jeanne Lamon, violin. It’s a great way to get into the spirit of the concert before you hear it live on stage. Since we are not including a recording of Böddecker’s Sonata sopra La Monica, you’ll have to come to the concert to hear it. Enjoy! The first piece on the program and on the playlist is H.I. F. von Biber‘s Fidicinium sacro-profanum no. 1 in B Minor (Nuremberg, c.1683). We included L’Armonia Sonora’s recording. The next track on the playlist is Dietrich Buxtehude‘s Cantata “Mein Herz ist bereit” (Lübeck, c.1680), featuring our guest artist, Peter Harvey, and the Purcell Quartet. Then we visit J.S. Bach’s mentor and cousin Johann Christoph Bach and his Lamento “Wie bist du denn, O Gott?” (Eisenach, late 17th century). The version we selected for the playlist is by The English Baroque Soloists with conductor John Elliot Gardiner. We revisit Biber and his Sonata no. 3 in F Major for violin & continuo (Nuremberg, 1681). This version is performed by Romanesca (Andrew Manze, baroque violin; Nigel North, lute and theorbo; Johnn Toll, organ). The final piece on the playlist is Johann Sebastian Bach‘s Cantata 82 “Ich habe genug” (Leipzig, 1727) with baritone Peter Harvey, and John Eliot Gardiner and The English Baroque Soloists. You can find this playlist on our YouTube channel at youtube.com/tafelmusik1979. Join us for Intimate German Baroque at Trinity-St. Paul’s Centre from January 19-22, 2017. Concert information and tickets are information is available here.